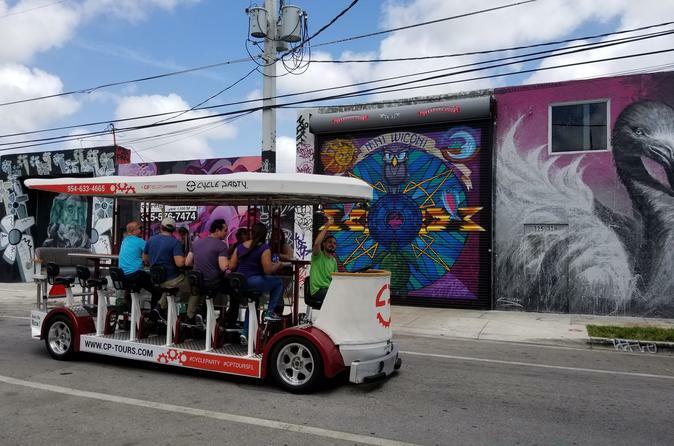 Cycle Party's Mural Tour is a great way to get a preview of the amazing neighborhood that is Wynwood. This is a 1-hour tour where you'll get to see beautiful murals, learn the history of the area and get suggestions on places to eat and things to do. Try out Cycle Party which is considered one of the most fun and unique experiences in Miami. Hop aboard our 15-person pedal powered party on 4 wheels! Cycle Party is one of the most fun and unique experiences in Miami. This vehicle can fit up to 15 people and is powered by the pedaling of the participants. Our bikes do come with motors just in case people get tired throughout the tour. Join us as we pedal back in time to Miami, 1917, and see the neighborhood of Wynwood grow before your very eyes. This one hour tour explores each decade through the industries and individuals that turned this ‘Barrio’ into the vibrant kaleidoscope of colors it is today. Your Cycle Party Pilot will come equipped with historical facts, music, and insightful knowledge of the area. We meet at Voah Campusbefore we head out on our adventure.